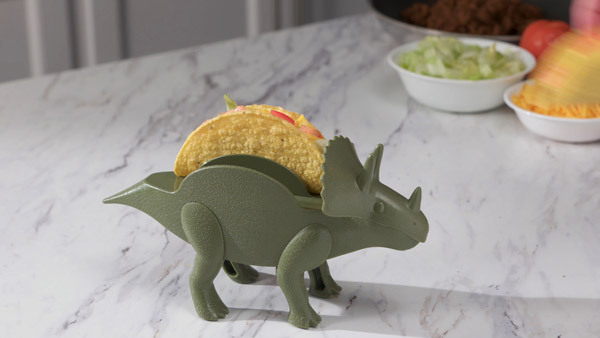 TriceraTACO Taco Holder: Make your taco look like a triceratops. The triceratops is a beloved dinosaur known for its distinctive three-horned skull and its hard shell... tacos. 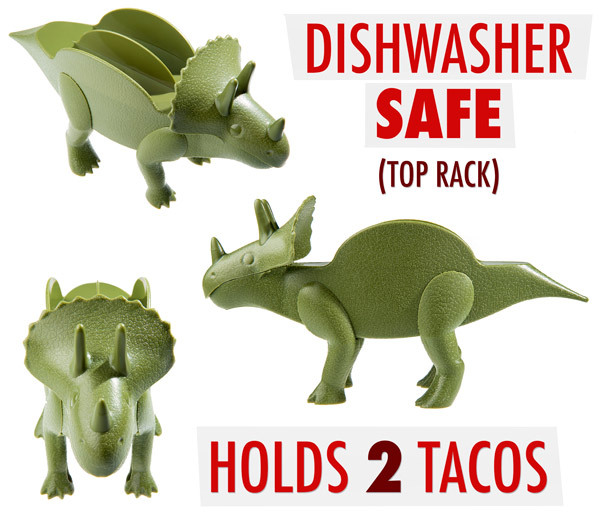 Enjoy a fossilized fiesta with a friendly dino when you serve up dos tacos in a triceratops. 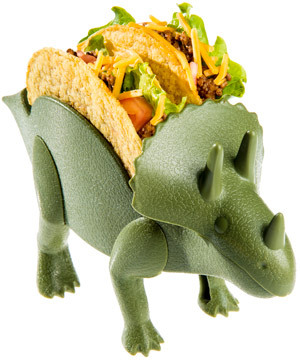 The food-safe sculpture of a tri-horn dino can hold a pair of hard shell tacos to admire or devour. Plate made for taco-appreciating dinophiles. There's nothing so satisfying as the cretaceous crunch of a hard taco shell. Celebrate your appreciation for all things taco—and all things triceratops—when you munch your favorite street food from a plate modeled after your favorite dinosaur. Give em’ a meal to tacobout. This three-horned plastic plate has four legs and holds two tacos. Of course, there's nothing stopping you from going back for seconds and reloading the prehistoric pack mule with more Tex-Mex. Once you've had your fill, load the dino in your dishwasher for easy clean-up. Question: How tightly do the tacos fit? Answer: Most crunchy shells nestle nicely, neither overly-squeezed nor falling over. Of course, a super-stuffed soft taco could be messy if you cram it in the slot. Answer: While it's more fun than most plates, this dinnerware does not articulate. Hopefully your taco vision isn’t based on movement.